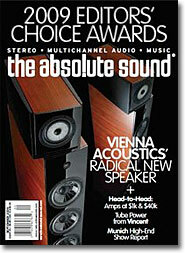 In this issue you'll find our 2009 Editors' Choice Awards, the comprehensive feature in which we list every product in every category that we recommend. At forty-two pages, the Editors' Choice Awards is by far the largest single feature we publish. But how do we determine which products make the cut -- and which don't? We start by taking last year's Editors' Choice Awards document and methodically fact-checking every listing to see if the product is still current and available for purchase, if there's been a price change, and whether the product is still handled by the same distributor. Discontinued products or those that no longer have North American distribution are automatically dropped. We next provisionally add to the list every product that's been reviewed in the intervening twelve months. Now that we have the raw material, the next step is a series of marathon conference calls among Neil Gader, Jonathan Valin, and me (the entire full-time editorial staff) to determine which products from the previous years should remain, which should be deleted, and which of the recently reviewed products deserve to be added. We consult the reviews to see how enthusiastic (or not) the writer was about the product, and if there's a question, I ask the reviewer if he or she thinks the product is worthy of an Editors' Choice Award. But what makes a product worthy of a TAS Editors' Choice Award? There's one simple criterion: Would one of us buy the product with our own money or recommend that product to a close friend or relative? If the answer is “yes,” the product stays. If not, it's gone. It's that simple. What's not so simple is when we encounter similarly priced products that have different musical attributes or form factors. For example, the category "Loudspeakers from $1500 to $2000" has nine entries, including such widely divergent products as the PSB Synchrony Two, Tannoy Autograph Mini, Magnepan MG 1.6, and the Reference 3A Dulcet. In this case, we can envision a system, environment, and listener that these loudspeakers will best suit. There's no clear answer to the question: "What's the best $1500 to $2000 speaker?" All we can do is give you a short list of speakers we've found to have merit, and provide our view of each product's strengths and shortcomings. From there, it's up to you to do your own listening and find the best match for your musical priorities. In some cases, however, one product is so clearly superior to another of the same (or higher) price that we simply cannot recommend the competitor. We can't imagine any listener preferring what we regard as the lesser product and so we remove it from the list. This happens most often in digital sources, where a new design outperforms older units. We then ask the reviewers of the newly added products to write the capsule descriptions. Those capsules are integrated into the master document, and then the whole thing is edited and prepared for layout. It's quite a process, but in the end we have a single feature that represents the condensed wisdom (we hope) of the entire TAS editorial staff and freelance writers who collectively have more than 240 years of experience reviewing high-end audio gear. Looking over the finished document, it struck me that the TAS staff has listened to, and formed opinions about, the roughly 500 products selected as winners of a 2009 TAS Editors' Choice Award. We hope that you find our selections a useful guide in assembling or upgrading your music system. TAS founder Harry Pearson's selections can be found in this issue's HP's Workshop. If you haven't been to www.avguide.com for awhile, you're missing a wealth of high-end audio news, stories, factory tours, product previews, commentary, and other great reading. For example, you can read about my experience with “The Best Stereo System I Ever Heard” and Jonathan Valin's visit with some of Japan's foremost audio artisans. Other topics include a listen to Magico's new Ultimate horn loudspeaker, an illustrated tour of cable manufacturer Transparent Audio's factory, a loudspeaker 20 years in the making that uses 32 full-range 3" drivers, and “One of the Best Preamps You've Never Heard,” to name a few. The Absolute Sound's Web site isn't a one-way street; you are welcome to comment on anything we say, or respond to other readers. It's an exciting and vibrant forum for TAS writers and readers that I hope you'll join -- and it's free.